I saw this article in Rowley Leigh’s excellent food column in the Weekend FT, for a room-temperature pasta dish with fresh tomatoes. Perfect for those of us boiling in a hot summer (Rome, NYC, etc.) Even in freezing, windy, temperamental London, it was probably one of the best, fastest and liveliest dishes I’ve made. 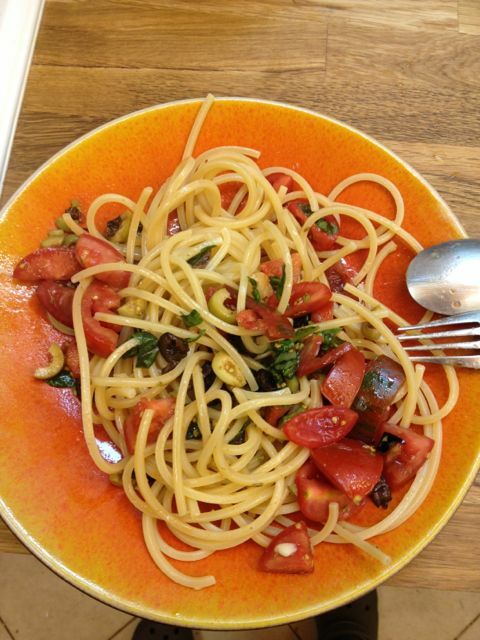 The general idea is to put cooked pasta in with ripe flavourful tomatoes, garlic and herbs, but Leigh’s recipe adds toasted fennel seeds and mint: the seeds in particular evoke the flavour of the mezzogiorno, the Italian south, that of spicy sausages, heat, dust, and the African sun. A very well-written background and recipe in the link. 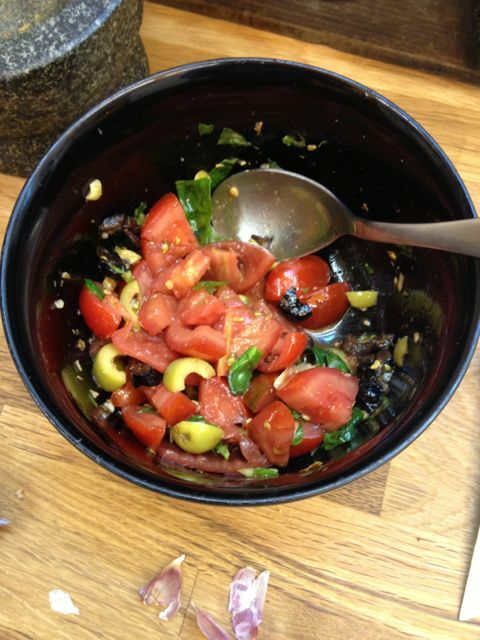 I modified it slightly: basil instead of mint, extra garlic, and a mix of green and black pitted olives. The tomatoes, mixed plum, green, and cherry, are Isle of Wight but pretty much anything (other than nasty Dutch hothouse jobs) would work in high summer. The pasta was bronze-extruded chitarra from Puglia; the hard durum flour of the south, whether Pugliese or from Gragnano near Naples, has a fantastic flavour and texture that can shine with the simplest of sauces (even just Basilicata’s poor dressing of oil and red chili flakes). Barilla and De Cecco bog standard pasta are okay, but Voiello (also owned by Barilla) is better; Eataly in Manhattan should stock more specialised brands. Finally managed to replicate one of the outstanding dishes at the great Soho Italian restaurant, Vasco & Piero’s Pavilion, on Poland Street. Given the prices at that unassuming temple to the food of Umbria, I’m chuffed to be able to make this one on my own (though their fish secondi, huge Negronis, and that all-but-vanished air of 1990s louche Soho, make it well worth the visit). The key in this dish, since the tuna provides very little actual flavour – rather it’s all about texture, is to get umami and body in the sauce before the tuna shows up. 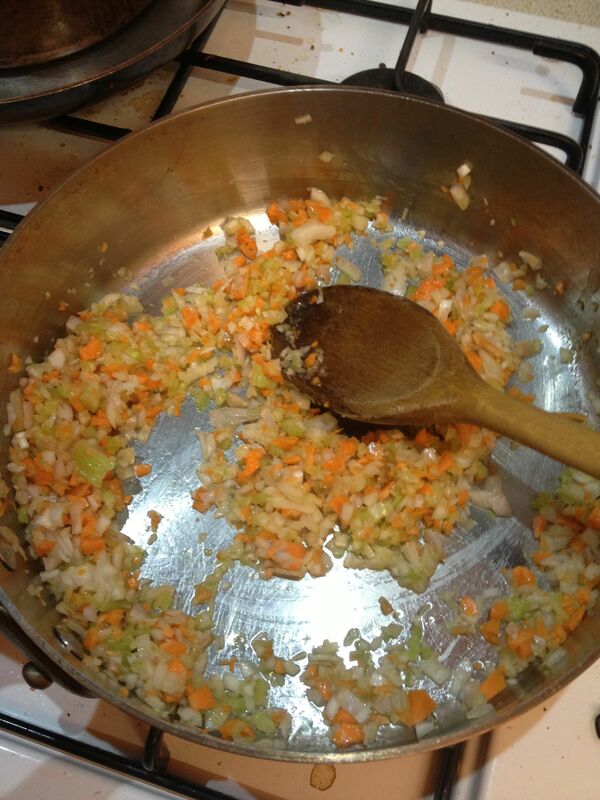 Start by making a standard soffrito of onions, carrots and celery, and sweat them until all are soft, with a clove of garlic and some parsley going in at the end. 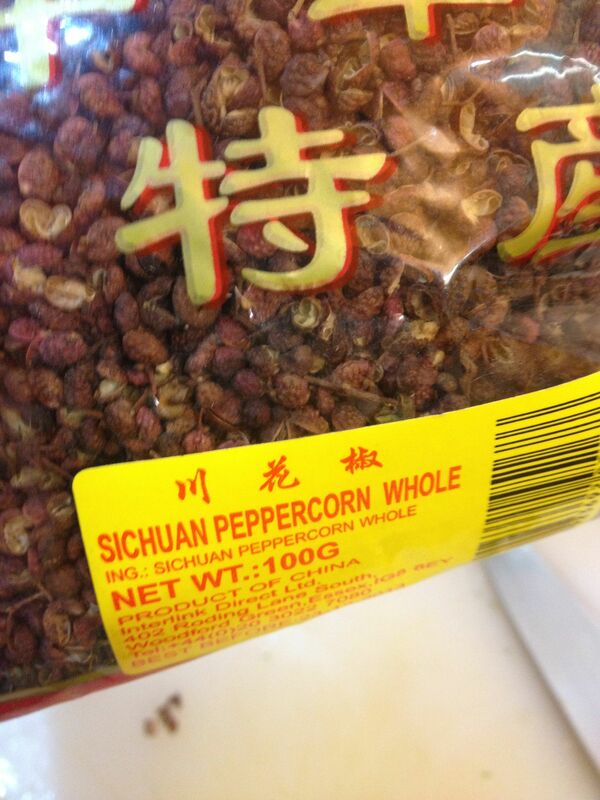 Just for grins, I add a pepperoncino and a few Sichuan peppercorns; they (especially the latter) are definitively not part of the recipe at Vasco ! 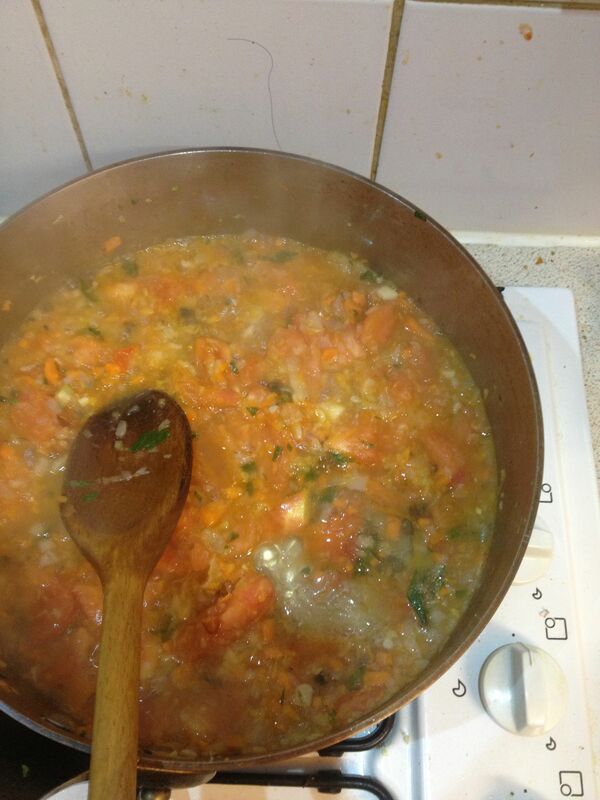 While the soffrito is softening, blanch a tomato for 10-20 seconds, remove the skin, and chop up, reserving the juices. 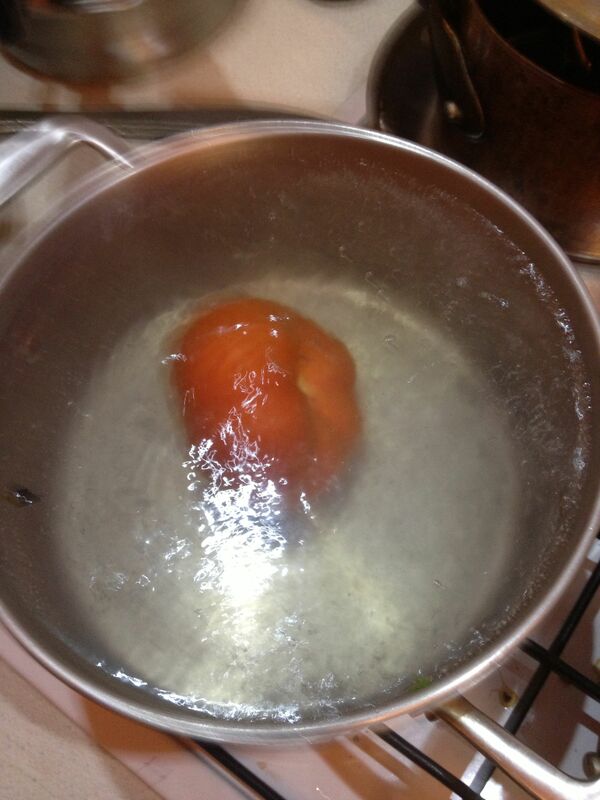 Toss into the sauce, and simmer until the tomato has broken down. 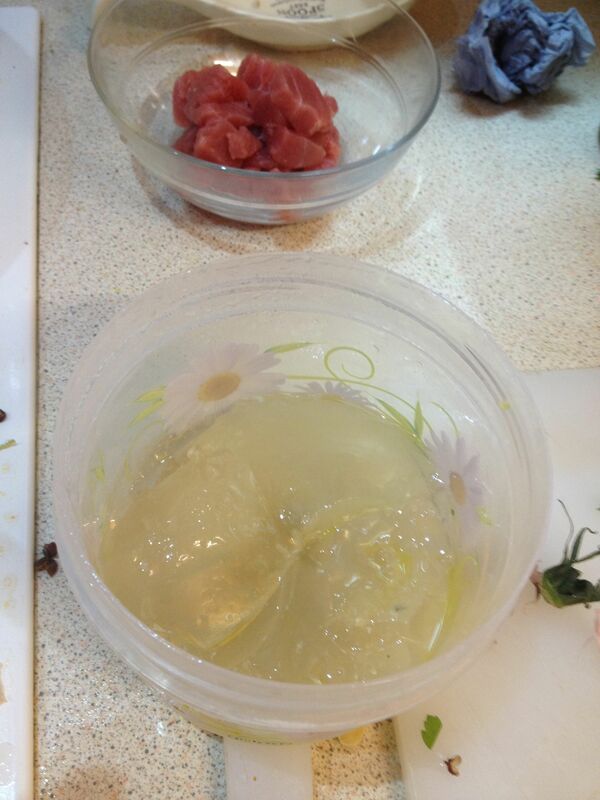 At this point, I add some fish stock – the gelatinous stuff in the photo (from a poached bream I made the day before). I also pour in a little white wine, and raise the heat to high. 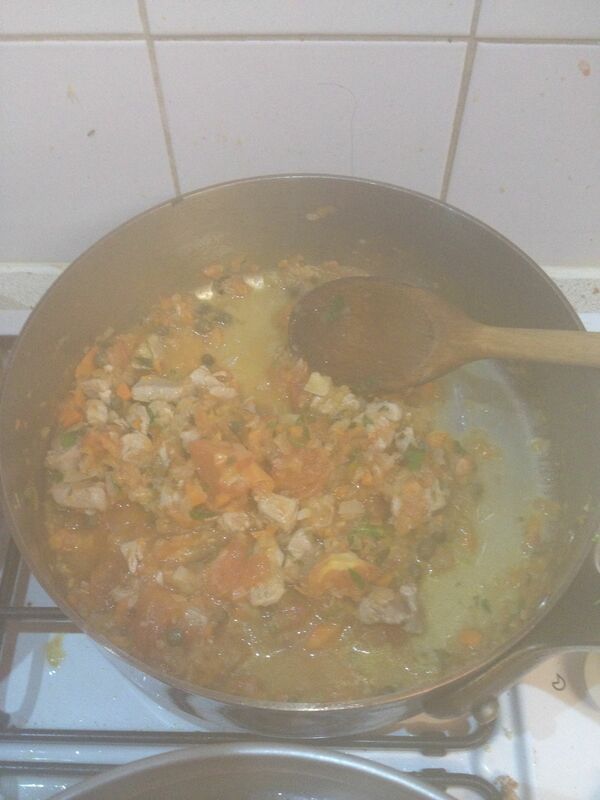 Reduce the mixture over heat, and add some salted capers, which have been soaked for 15 minutes to desalinate. Check for balance, it should have a slight sour edge, and I needed to add a little vinegar. 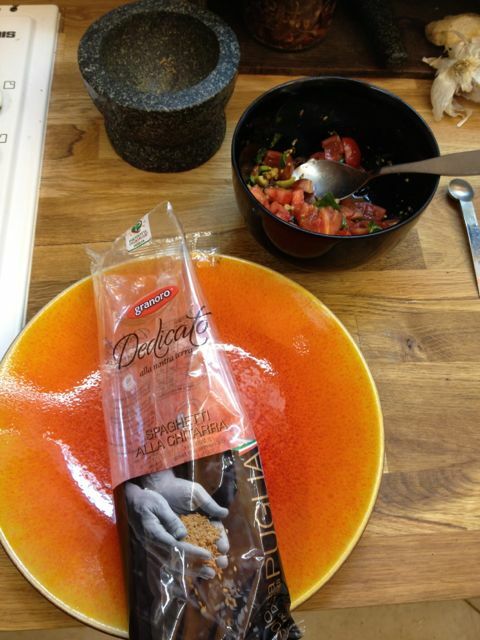 Put the chopped tuna in last, so it doesn’t overcook. Once the pasta (I’m using Voiello from Caserta, near Naples – current favourite over De Cecco or Barilla) is ready, place it in the pan, along with a little of the pasta cooking liquid and some olive oil. Agitate violently over a high burner, driving from the shoulders & hips, to get it all to mix, and serve with fresh parsley. 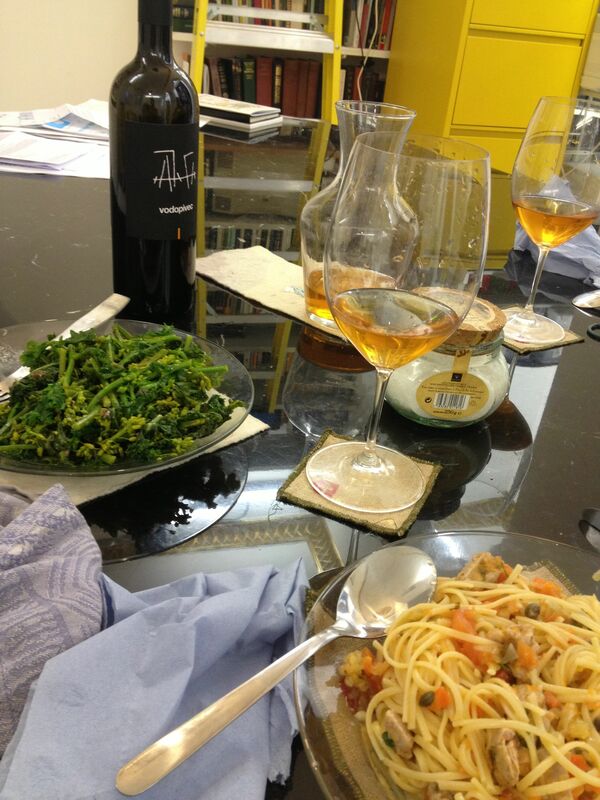 Vegetable was sprouting kale from Broadway Market, and the wine is an orange wine from Friuli’s Carso zone, Vodopivec. Pretty decent wine, but at the price worse value than La Mole (from Quarticello in Emilia Romagna), nor as exciting as the (more expensive) Ribolla Gialla (from Friuli’s Radikon) nor the austere reverential Breg (from Friuli’s Gravner). Cime di rapa salad: raw, with green olives sliced up, and some very sour dressing. Found it at Il Sorpasso (Sicilian place) in Ferrara. Farinata: a chick pea pie, baked in oil until it goes crispy. Somewhat tasteless but very moreish. Ligurian specialty. Cappon magro: a layered pie of vegetables, fish, prawns, oysters, topped with a green sauce. 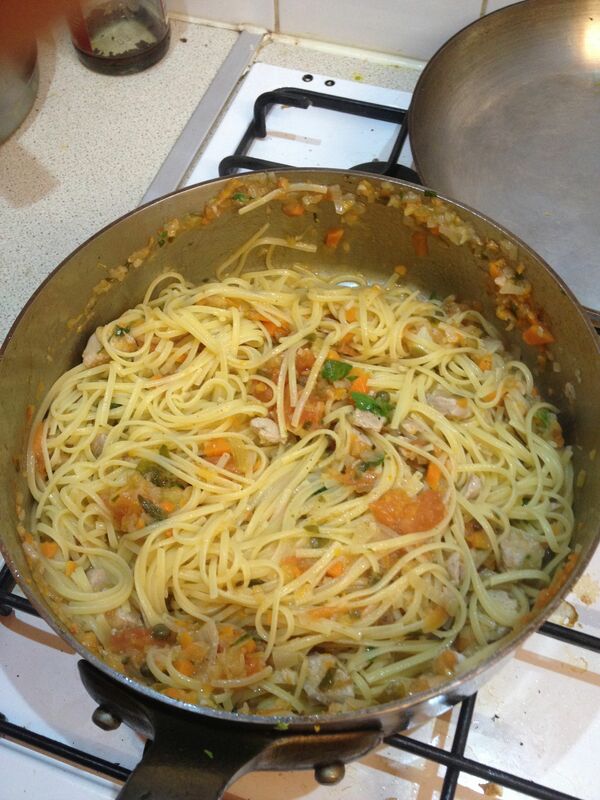 Old-fashioned Lenten dish, but quite involved, reminiscent of Monzu cuisine of Sicily. Ristorante Montallegro, Genova. Fish (eg sea bream), topped with baby artichokes stewed, on a bed of mashed potatoes. Sauce seems to be artichoke liquor, wine, garlic, maybe some fish broth. Antica Trattoria della Palla, Genova. Stoccafisso with olives, boiled potatoes, parsley, garlic, oil. 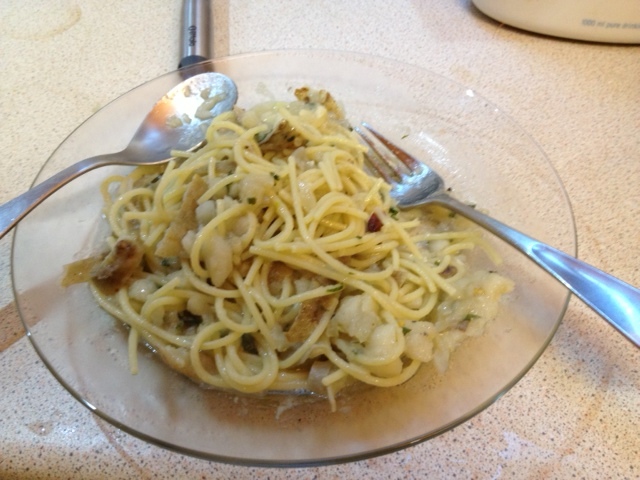 Divine dish of Liguria. R Montallegro, Genova. I heard from a friend from San Remo… the old way of softening the fish was by putting it in a bag & hanging from the belt – eventually as it slapped against the thighs, it softens up. This charming task was mostly left to the stupid son of the family. Hence called branda cujun in San Remo slang, a “stupid brandade” of sorts. Risotto alla pilota: Mantovan specialty, boiled rice (generally Vialone Nano, shorter and less starch-shedding than Arborio, Carnaroli, etc), mixed with boiled pork, mostly lean/loin, or else pork sausage. Not wet or cheese-laden like a Milan risotto, and faintly garlicky – almost tasteless but delicious. Lasagne with white veal sauce and artichokes. Mantovan/Ferraran specialties. Capellacci stuffed with pumpkin, crushed amaretti, and mostarda, in a meat sauce. Mantovan/Ferraran. Poached pike with salsa verde, and grilled polenta. Mantovan. Risotto made with fresh-water fish. Mantovan. Pasta with cime di rapa and sausage meat. Ferrara.